Described by Johnnie Walker as an “unrivalled masterpiece” this is doubtless the best known super-premium blend on the market. It is said that only 1 in 10,000 casks are deemed of the quality required to make this excellent whisky. This blend contains some of the oldest and rarest malt and grain whiskies in the mighty Diageo reserves, and is said to include spirit from Clynelish, Caol Ila, Royal Lochnagar, Glenlossie, Glenkinchie, and Cameronbridge. The whisky balances spirit from every whisky-making region in Scotland. 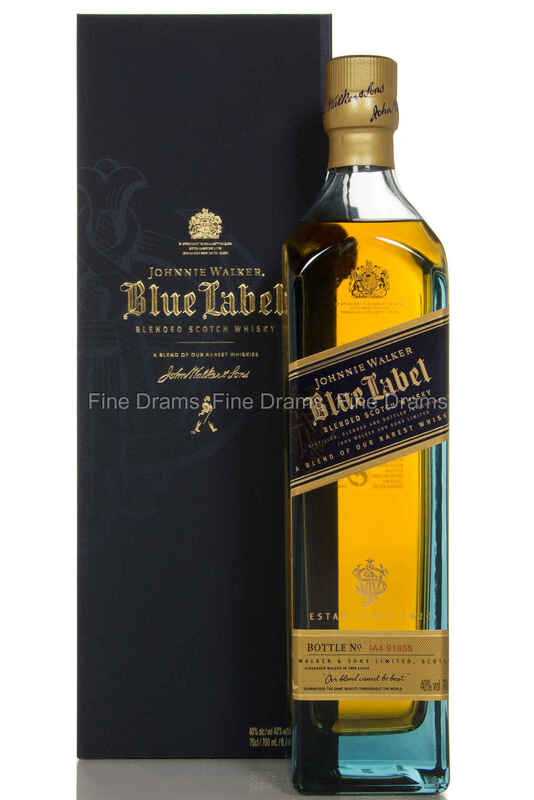 Blue Label possesses a rich, velvety mouthfeel, which brings citrus notes of caramelized orange, kumquat and tangerine, there are touches of sweet biscuits, Demerara sugar, hazelnuts, dark chocolate, ginger, dried fruits and dense vanilla. The very faintest hint of peat smoke adds depth and complexity. Packaged in a sophisticated bottle, with the trademark slanting Johnnie Walker label, this is one of the finest blended whiskies ever made.